The Saona 47 is more of the same from FP, slotting nicely between the Helia 44 and the Saba 50, which is no bad thing because it continues the sensible theme of comfort combined with seaworthiness, writes KEVIN GREEN. Named after a Caribbean island – where the shallow drafted Saona 47 would be ideal for, this cruising catamaran offers three levels of useable space to give cruising sailors plenty options while having an extensive sailplan for passage making. Distinguishing features on the Saona includes its 9.2 metre square lounge deck and a hydraulic swim platform for those long days at anchor. While, below decks there are up to five cabins and all this is contained in a more rounded hull shape and generally smoother aesthetic than its two siblings mentioned earlier. Ambling down the dock at La Grande Motte – Europe’s largest multihull show – to seek out the FP47 was quite an experience for me because the competition to this cruiser was near at hand. Debuts here included the new Leopard 45 and the Nautitech 46 Fly – so there was little room for complacency. Cruising catamarans like these and the FP47 are distinguished by being voluminous, having simple hull shapes with mini keels (rather than performance daggerboards) and layouts that are generally more suited to liveability rather than purely life under sail. Given that most boats of this type spend the majority of their time stationery, liveability is a key point and this is where FP often distinguishes itself. The FP design creates three levels of living space and a completely sheltered aft deck which extends the interior living space, while the sail controls are safely located on an elevated starboard bulkhead. 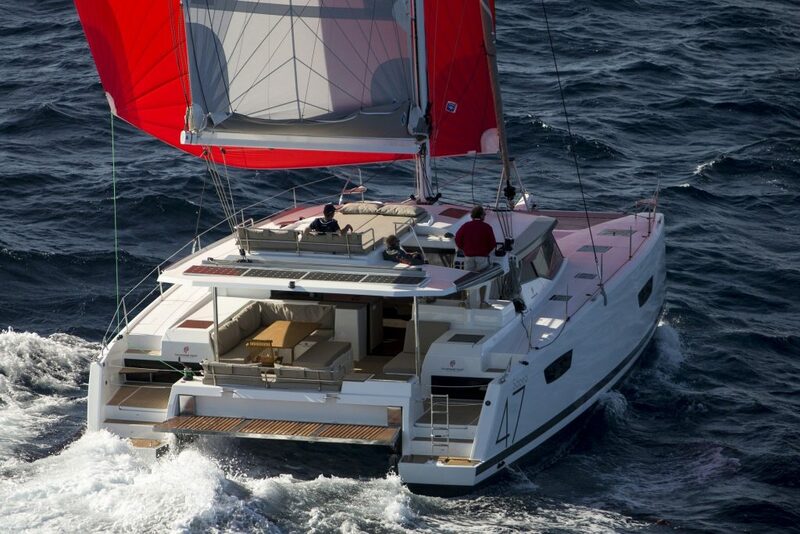 This layout has proved a popular design for both the Saba 50 and Helia 44, so continues on the Saona 50. Steps from the aft deck lead to the starboard helm station where the sail controls are separated from the helm by a walkway. These steps also can have the liferaft behind them for quick access. This helm station arrangement is a signature feature of the brand and differentiates it from many others. Ideal for crewed sailing but less convenient if short-handed it allows the trimmer plenty of room to work the two electric Lewmar 50s and one manual 55 winch for halyards and all sheets. Lines are tidied away in large rope bins which avoids the passageway becoming untidy. Behind the helm lies the main track which sits at the end of the boom so offers maximum control of the square top mainsail. The wide bench seat at the helm seats two and the small binnacle allows movement around it – should the steerer need to dart forward to trim after switching the Garmin auto pilot on. Nearby are steps to the flybridge cockpit – more than a mere sunbed as found on the smaller model – which has ample headroom under the alloy boom when at anchor. The all-weather aspect of the aft cockpit is major feature on the Saona allowing diners to enjoy the outside table yet be right beside the inside galley. Wide doors and a sliding galley window create an airy through space which is ideal for the tropics, yet can be closed during inclement weather, while the fibreglass roof allows the entire area to be enclosed with clear plastic. Practical internal design by Isabelle Racopeau creates a very liveable space with near upright outside bulkheads to minimise sun intrusion and maximise volume. The corner lounge has a coffee table as standard but I believe a taller one can also be fitted and the navigation station is large with main switchboard nearby in the corridor to the owner’s cabin. Good practicalities include a swing seat at the chart table, allowing more space when needed and large opening front windows. The galley is spread across the aft part of the saloon plus an island bench that acts as a supporting bulkhead for crew when in a seaway. Clear views aft mean washing up in the double sinks shouldn’t be a big chore and there’s a four burner gas stove with separate oven-microwave. Good for those long cruises are the energy efficient twin drawer refrigeration for perishables and there’s ample cupboard space. Our boat also had the optional drawer freezer beneath the starboard pantry. All that’s really lacking are fiddles on the composite worktops and smoother edges on the bulkheads. This only slightly detracts from what is a comfortable space with abundant natural light from the large surrounding windows and skylights. Our review boat was the three cabin owner’s Maestro version (plus skipper’s bunk) which devoted the entire port hull to a spacious suite, sealed off by a sliding door. Alternatively and with chartering in mind five cabins can be specified (with five bathrooms). Stepping down into the port owner’s cabin brings you into a vast space with towering headroom, reflecting the tall topsides. These stairs cover the escape hatches – essential on any sailing catamaran – which can be opened (rather than requiring breaking in an emergency). The owner can enjoy views aft from the rectangular window over the large island bed, plus there’s an opening porthole for that welcome through breeze at anchor. Moving into the cabin’s centre, the vanity desk is dual purpose and surrounded by deep lacquered cupboards with others finished in light Alpi wood, while the large screen television manually swings out for viewing while in bed. Moving forward brings me to the bathroom which has a huge longitudinal shower cubicle – with opening portlight – while a separate electric toilet is in the bow. Beyond this is a large bow locker where light and bulky equipment can be stored. Ideally a full height water-tight bulked would be incorporated here but a lower one is I believe incorporated. 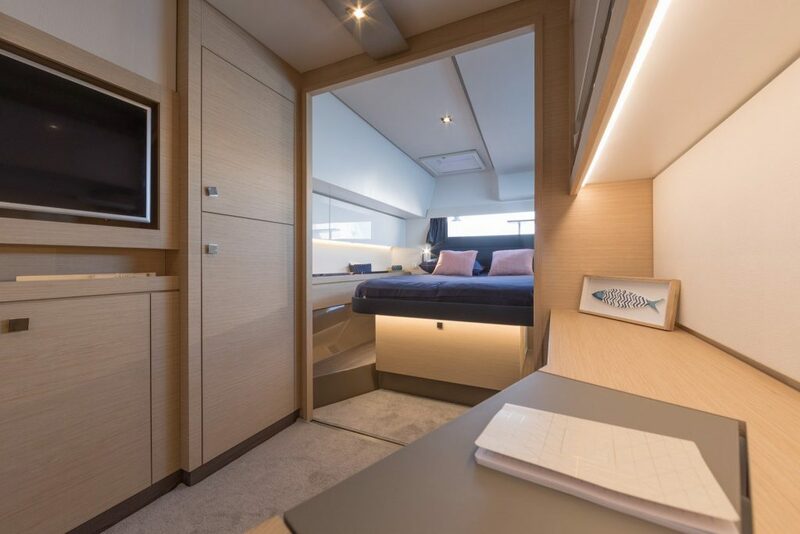 Climbing over to the guest accommodation in the starboard hull brings you into an equally comfortable area with spacious semi-island bed and ensuite aft. Forward is an athwartships island bed with corridor bathroom. The large cupboard in the corridor can also house the optional washer-dryer – which runs from the 11kw Onan generator. Under-bed storage is another good feature in all cabins. Beyond this is a crew cabin in this port bow area which comes with a manual toilet and single bunk. Flat topsides are a major attraction for cruising cat buyers, a fact Fountaine Pajot is acutely aware of, which is why the Saona has wide sidedecks with flush hatches, and a foredeck for partying on. A smaller trampoline area in favour of larger nacelle creates space for three sunpads but the practicalities aren’t neglected. A deep central locker houses a vertical Lewmar windlass/capstan which has s short run to the nacelle front where the anchor sits – so no rode to endanger children or unwary guests. A second roller is available for another more ground tackle as well while the fibreglass bowsprit proved long enough to give good separation between the Code 0 and the forestay. Sizeable cleats all around, including midships were other good features on the Saona. Looking aft, the hydraulic teak clad swim platform is a 24,000 Euro option worth having as it doubles as a dinghy bench. Looking at the rig, our review boat – hull one – came with a carbon mast and versatile sail plan on the cabin mounted spars. A carbon Maxam mast (from Poland) was attached to an alloy Z Spars boom with guttering and lazy jacks for gathering the Incidences mainsail. The sail was panelled using Hydronet sailcloth – a tightly woven polyester mixed with dyneema – which allows both easy sail handling with longevity and minimum stretch sailcloth. “You save about 15% weight with the carbon mast, which adds stiffness and reduces pitching,” FP director Yves de Kerangat told me. Single wire shrouds held up the rig, with large chain plates to spread the load of the squared top mainsail. Improving performance is an ongoing facet even for sedate cruising catamarans, so the company has collaborated with the iconic the Berret-Racoupeau house to optimise the Saona. The more curvaceous topsides are matched by a similarly shaped nacelle and inner gunwhales to reduce wave drag. Hull and deck construction is by infusion – to optimise the fibre/resin ratio that impregnates the foam core while the saloon roof is injection moulded. Underneath, moulded mini keels give directional stability and modestly sized twin rudders control the Saona. The volume in the aft of the hulls is apparent when I open an engine hatch, which showed the 50 HP four cylinder Volvo saildrive to be rather dwarfed by its surroundings; leaving plenty space in the port bay for the Onan generator and filters. Also, quick access is available here for the steering crossbar and rudder stocks. The Med is typically a hard task master for sailing yachts, as it either blows too much or too little and our sail it was the latter with 7.0 knots gently caressing the smooth seas. To cope with these conditions and minimise engine hours, a wide sail plan is required. So our the Saona 47 came with a large Code 0 sheathed inside a snuffer for quick deployment and dousing. Once we’d hoisted the Code 0 on its furling line – the halyard is at the mast base – the sock was peeled back to allow the sail to fill while on the helm I eased the catamaran off the wind to about 160 degrees, pushing our speed to 10 knots. The elevated starboard helm gave me clear views of main and the Code 0 while just in front of me the crew trimmed the sheets. Being separate from the binnacle prevents the steerer from trimming the sheets, but this layout does allow plenty room for crew to do their job. So when it came to gybing the Code 0 I concentrated on turning the fairly large steel steering wheel while my crewmate trimmed and a third person walked the clew around the forestay as we changed heading. On port tack trimming was done from a remote winch near the port quarter (while starboard was managed from the coachroof bank of winches). Wanting to sail nearer the wind, the snuffer sock was easily pulled down over the Code 0 and the long sausage of sail dropped on the foredeck, while my crewmate unfurled the genoa, which allowed me to point the cat at 50 degrees apparent, with our speed slowing to 4 knots. Short-handed in these light conditions, the engines would likely be spun up so I did so, reaching a top speed of 8.8 knots with the Volvo 50HP spinning at 2,000 RPM; while dropping the revs to 2,200 still gave a nippy cruising speed of 7.9 knots (but no fuel burn figures were shown). Our Med afternoon showed the Saona 47 to be a very capable cruising catamaran; reflecting Fountaine Pajot’s vast experience in building comfortable and seaworthy boats.